A couple of weeks ago, while out hiking the 100-acre woods, I discovered this well-engraved tree when wandering about the forest off-trail. Dead tress that have lost their bark are not an uncommon sight in a mature forest. Sometimes the cause of death isn’t clear, for instance if the tree was killed by disease or defoliation. 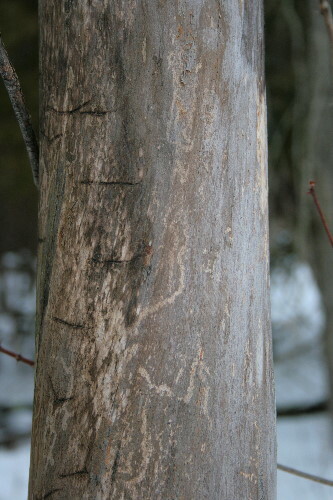 However, trees that are killed by engraver beetles, members of the subfamily Scolytinae (interestingly, now considered to be a member of the family Curculionidae, the true weevils), leave clear evidence of their past presence. 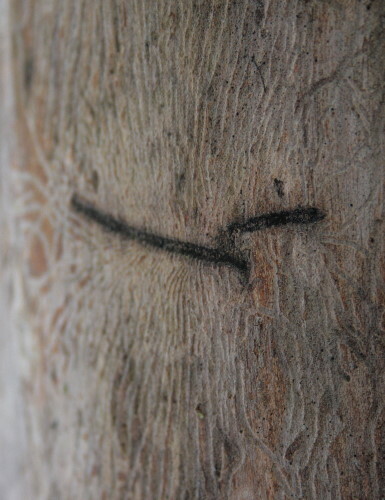 The galleries carved into the bark by the larvae as they feed are often quite intricate, and give the group their common name. The galleries on this tree caught my eye both because they were dark, and so stood out from the pale-coloured trunk, but also because they were all perfectly horizontal. Also interesting to note was that they were all on the north side of the tree. I assume this had something to do with either light-avoidance or heat-avoidance, since the tree stood near the edge of the woods and its south side would have been warmed by the sun. Quite often you can identify the species that made the engravings by the patterns of the tunnels. The only species that made horizontal galleries that I could find mention of online was the Fir Engraver, Scolytus ventralis. The site that I initially found the info at said, “The gallery pattern of the fir engraver is unique” and “distinct gallery pattern … distinguishes it from associates”, a statement that was repeated on a couple of other pages. This one was for the Rocky Mountains. I tried to find any mention of the species, or any other species that made horizontal galleries, in Ontario or the east, but didn’t turn up anything. So much logging is done in western North America that a great deal of literature exists for forestry pests on that side of the continent. So I’m working on the assumption that this is the work of a Fir Engraver, and that the dead tree is therefore a fir. Despite the fact that this pdf says they’re only found as far east as the Rocky Mountains. Any eastern folks know an alternative ID, or perhaps a good reference to engraver galleries for this region? Edit: Upon following a link to a government website for reporting exotic fauna, left me by a commenter, below, I discovered some information on the native elm bark beetle, Hylurgopinus rufipes (that’s the beetle that’s native, though I suppose the elms are also native). This is the species native to the east that creates horizontal galleries, so these photos are almost undoubtedly of elm bark beetles. 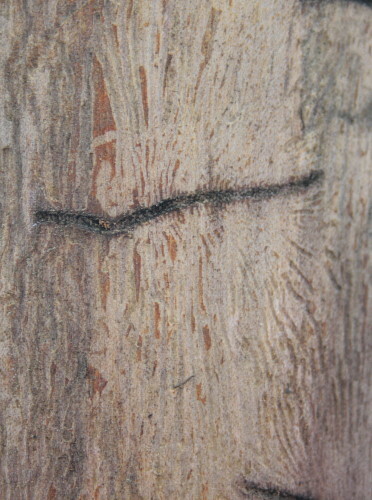 The adults feed on the soft bark of young twigs on healthy trees, prior to mating and laying eggs, and are one of the primary vectors of Dutch Elm Disease as individuals move from one tree to another during their foraging, picking up the fungus from infected trees, and infecting healthy ones when they’re feeding, in areas where the disease is present. The info page notes that it’s the disease, not the beetle itself, that usually kills the trees, since females usually seek out already dead or dying elms in which to lay their eggs. Whether this elm died from DED or some other cause I cannot say. The thick horizontal line was bored by the parent beetles. The adults both work on the tunnel, with one boring first and creating a mating chamber. The female bores away from the chamber after mating, laying her eggs along the sides of the tunnel. In the case of the Fir Engraver, she bores across the grain of the wood. Females of other species will bore with the grain of the wood, or at random. When the eggs hatch the larvae tunnel perpendicular to the female’s tunnel, creating the pattern seen here. The larvae’s tunnels end when the grubs get large enough to pupate. They overwinter as larvae, finish growing in the spring, and then pupate and emerge in early summer. Cool. The pattern (especially in the top photo) look like the simple pencil drawings of flying birds that dominated my doodles when I was small. They do, don’t they? I wonder why some have a V shape and others are just straight. Absolutely fascinating,as all of your blog posts are. You bring to light a whole perspective of looking at the natural world that is otherwise cloaked to most of us mortals, and certainly totally foreign to me. thank you! Hee. Thanks, Rochelle! I’m glad you enjoy them. That is exceptionally cool! The first photo looks like a piece of art, an impressionist rendering of birds in flight. What a neat find. And that the marks are only on the north side of the tree creates a strange dichotomy in that second photo. It sounds like your research turned up the most available answer. It’ll be interesting to see if anyone has more specific knowledge in that region and can provide confirmation or an alternate species. It was pretty striking to see the whole tree covered in these marks, Jason. It’s too bad it just doesn’t show up as well in a photo from a distance. A bit more research, as a result of a series of links starting with the one Fiddlegirl provides below, suggest that this is actually the work of the native elm engraver, so I’ll have to update the post. God knows having a species transported across continents or oceans by human activity and settling somewhere else is nothing new. Thanks for the link, Fiddlegirl. I went to that, and then followed it to another, and then took that someplace else, and eventually ended up discovering that the native elm engraver also does horizontal galleries. 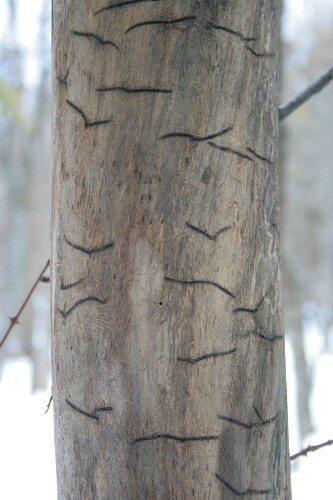 I guess the elm engraver is an eastern species while the fir engraver is a western one, so out west it really is the only species to make that pattern, and here in the east forestry isn’t a big industry so there’s little literature dealing with these things. Thanks, Diane! I’m really glad that you enjoy reading it. I have to agree with Diane. You enlighten us all. I love your new header. Thanks, KaHolly. Raven was feeling particularly playful that day, I couldn’t get her to sit still for more than 30 seconds – she just wanted to roll in the snow! Fascinating! The more zoomed in, the more it looks as though the tree was branded by a hot iron. It does rather look like that, doesn’t it, KS? I’m not sure why the main galleries end up turning so dark in colour. It would be a lovely decoration, Vicki. I wonder what one could create with it that would show off the patterns. Well, I see I’m not the only one who saw “seagulls” in the etchings of your first photo! What a great find. It does look strikingly like a flock of child-drawn gulls, doesn’t it? It’s too bad I couldn’t adequately capture an image of the whole tree like that.